A players inability to win is the most common complaint about Plague Inc. on the net. Plague Inc. is fun and addicting because you need to employ true strategy, a trait most iOS apps lack. If you're looking for boring step-by-step instructions you can surely find them elsewhere. This post will teach you about the strategy of Plague Inc. You can apply the lessons you'll learn here throughout the game. You will become a master of your own Plague! This alone killed me when I was trying to beat the fungus level in particular. Most first level symptoms are not fatal. They are necessary to get you to the second and third level traits which can prove fatal. While investing in the first tier of symptoms from every base symptom will make your pathogen more severe, it will NOT make it fatal. Remember, to win you have to KILL, not infect. Those pesky scientists are efficient once they discover a cure. Check out the Symptoms Encyclopedia for more info. Note: Drug resistance does not make a pathogen more lethal, only harder to cure. I still contend India is the best place, but there are several schools of thought. For a more in depth look check out. The Best Place to Start your Plague. By far the most read article on this site. In order to kill everyone, you must first infect everyone. To do that you need to spend your precious DNA points on transmission. Investing in most transmission means (other than air and water) will increase the likelihood of mutations. Mutations have the double benefit of being free and increasing how many DNA points you get with each infected country later in the game. 4. Don't let trends and graphs fool you. You'll be amazed at how difficult the last few people can be to infect. Many times people will think they are on their way to winning around only to discover they didn't actually kill everyone. If you don't get the message "There are no healthy people left in the world" their are uninfected people working to fend off your pathogen. This issue is most common with the fungus level but can occur on any level. If you are about to wreak havoc with lethality, make sure everyone is infected or your disease will stop spreading, leaving a few pesky humans around. With one exception, you get points refunded to you for devolving any attribute, not just symptoms. Transmission, symptoms and abilities all get you 2 DNA points refunded. The only catch is that re-evolving them is much more expensive. The point to remember is that if you don't need a particular trait anymore, get the DNA points and use it for something you need. For example, if every country is infected, there is no need to have the air and water transmission traits. Those 8 points will go a lot farther in stopping cure research or upping the lethality of your pathogen. This is to save you time and frustration. If one of the pesky countries (Iceland, Greenland, Madagascar, New Zealand) closes its ports before it is infected. Quit and start over. The only chance you have is on the fungus level where you can release more spores...you might just get lucky. I'd also like to see this added to other levels. What are your go to tricks for beating plague? Leave your recommendations in the comment section. You've breezed through the first few levels but now you're stuck. You keep waiting for the fungus to hit the last few island nations but before you know it, the damn scientists are dispatching the cure worldwide. The fungus pathogen is arguably the most difficult to beat but I'll tell you how, step by step. But first, where to start? Most of the time I like to infect India first but for the fungus I prefer Madagascar, which will spread to either South Africa or Australia. Wherever you choose to start, you'll probably want to switch the game to fast forward mode because you need to sit back and wait, silently as the fungus spreads. You can access fast forward mode by clicking the down arrow underneath the date in the upper right hand corner of the game screen. Keep collecting DNA points by popping the red and orange bubbles. 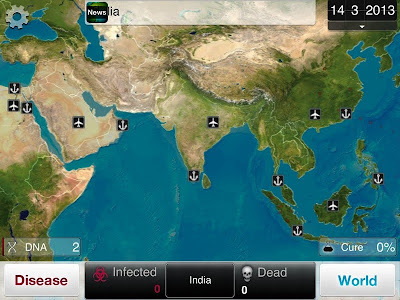 The fungus level on Plague Inc. is so challenging because it is difficult for the virus to survive long distances (such as air travel or sea travel). Because of this you have to invest your DNA points in transmission. Depending on which country you start with, begin spending points on bird or cattle transmission (level 1) but save up points so you can upgrade water transmission to level two. About now you should be getting notifications that your fungus is mutating causing new symptoms. In the past this was great news, a freebie but in fungus mode, symptoms are bad news. As soon as a new symptom developed you need to devolve it. To do this, click on the disease, then the symptoms tab, click on the brightly colored symbol and select devolve. As an added bonus you'll get two DNA points. We'll need those in a minute. Because I'm impatient I like to upgrade both air and water transmission to level 2 and then upgrade to the bonus bioaerosol. While expensive, this will maximize the likelihood of the fungus surviving oversea travel. This is critical because it is the only way to infect the pesky areas like Greenland, Iceland and New Zealand. As long as you keep devolving symptoms, the fungus won't be discovered. You need to keep your eye on how the fungus is spreading in countries. Again, Greenland and Iceland are notorious for having slow infection rates. If you start killing people too fast, all the infected people will die and can't infect new people. Keep being patient, keep devolving symptoms and tracking your infection spread and saving up DNA points. I like to wait all the way until you receive the message "there are no more healthy people in the world". Once you get that message, unleash hell. To do so, I prefer the symptom tree: coughing - pneumonia - pulmonary edema - pulmonary fibrosis - total organ failure - coma. For a full list of symptoms, their parent symptom and effects. Check out the Plague Inc. Symptom Encyclopedia. With two lethal symptoms - total organ failure and coma, the world will be rid of humans faster than you can imagine. Congratulations. You've beat the Plague Inc. fungus level. One of the common complaints against Plague Inc. is that a user apparently wins a game but then the next level does not unlock. 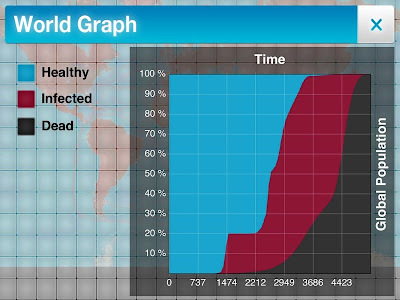 Plague Inc. might be a tad glitchy at times but this is almost always because the user did not in fact kill everyone. Plague is not about killing 6.5 billion, its about killing EVERYONE. In fact, when this graph was taken, 500,000 people remained alive. The graphs are interesting but can be misleading. The problem is, you did NOT in fact kill everyone. This happens when your disease is too deadly to be actively transmitted throughout a country. If you have not received notification that "There are no more healthy people in the world" and the game ends, you have lost. The most likely culprit is probably Greenland or Iceland. Pathogens can be extremely difficult to transmit throughout the entire populations. If you find yourself in a situation like this you need to enhance your pathogens ability in cold climates, that's the "snow flake" to level 2. That'll get those pesky Greenlandians! Otherwise, your only hope is necrosis. The June 12th update to Plague added a few new features, but by far the biggest improvement was fixing the crashing issues for older iDevices, particularly the 1st gen iPad. This will no doubt raise the juggernauts rating to five stars. Here are ten things we'd like to see in the next update in the app store. 10. Super fast forward - The game play is very well placed but for the more advanced players or for those caught with a slow spreading pathogen or Icelandians dying at the pace of ten per day, the option to speed up game play would be a welcome addition! 9. More countries - This will only be possible with an updated map and an improved interface that allows for easier zooming and navigation. The added complexity and DNA points would be good but its already difficult to click on some countries. 8. Targeted pathogens - We want to see a new dimension from the all or nothing approach. How about a nano-virus that must destroy Russia, without killing South Africans? 7. Region Mode - Instead of infecting the entire world, focus on a small detailed area such as Central America. Infections could transmit from city to city. 6. Increased game dynamics - Too often a single event seals your fate. New Zealand closes its port? - you might as well start the game over. Make it possible for ports to reopen and pull back the alarm, significantly slowing research etc. 5. Multiple saves - Now that the crash problems are fixed this is less of an issue but multiple saved games would be a nice convenience. 4. More random events - The bird migration events are cool but too frequent. There should be more events but more random in their effectiveness. A colder than expected summer in the southern hemisphere, a hijacked Aussie flight, a fire at the Canadian research facility - they'd all be great. Less predictable and more exciting! 3. Cure mode - turn the tables on the pathogens and invest points to stop the spread. 2. Retina graphics for the iPad - Version 1.1 brought a full iPad version but the graphics and interface still have a lot of room for improvement. 1. ZOMBIES! - The folks at Ndemic hinted at it. I'm expecting it, and soon...by the end of June soon! You heard it here first. In plague, you must play to win. That means killing EVERYONE - not six and a half billion people, everyone. But where is the best place to start? There are two schools of thought on this, I’ll provide you both. Usually this means, Greenland, Iceland or Madagascar because they can be notoriously difficult to infect. I’ll throw in New Zealand and the Caribbean as others that can seem immune from an inbound plague. Because these regions can be so difficult to infect one strategy is to start your plague in one of the regions. Personally, I have had the most success with Greenland and Madagascar. 2. A poor country with a seaport and airport. For me this usually means India. Despite being described as a rural country, there are over a billion people to infect in India. They have a relatively modest medical research budget, which is nice to take out when you turn the heat up to kill everyone. With India you have the potential to spread your pathogen by air, land or sea. This will maximize your ability to infect as many countries as possible, as fast as possible. Plague divides the world up into 58 different regions. Many regions are individual countries such as United States, New Zealand, and Russia but other countries, often small and poor are lumped together into regions such as Central Africa, East Africa or the Baltic States. Sometimes a single country name will represent a region of more than one country. Different pathogen mutations have drastically varying levels of effectiveness based on the individual traits of the country such as wealth and climate. Because Plague Inc. is a “hyper realistic” game it is imperative that you familiarize yourself with these areas. 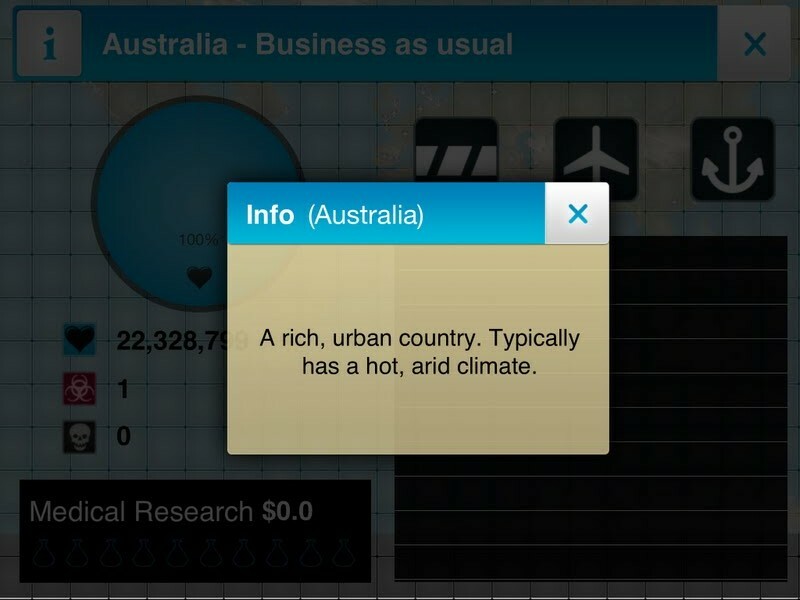 For each of the 58 areas you should learn whether the climate is hot or cold, rich or poor ad urban or rural. Take time out to click on the information icon of a region. To do this, click the regions name at the bottom of the screen and click the letter “i” in the upper left hand corner. You’ll be presented with information such as that shown below. Don't have the time or patience? Read the Plague Inc. Atlas.